After I finished sweater refashion part 1, my feet were cold so I pulled the sleeves on like socks and walked around wearing the rest of the sweater as a pair of attached socks for the evening – probably not recommended, but I never did trip, so that’s good news. Other good news: they kept my feet warm! So I decided that what I would do with the sleeves is make myself a pair of knee-length lounging socks for days I spend a large portion of my time working on projects at home. I usually wear slippers when I’m in the house instead of tennis shoes, and I thought these socks would be perfect to wear under them. My feet get painfully cold (especially in the winter) when I’m sitting around sewing or working on the computer and can sometimes only be alleviated by tucking them under one of the dogs while he sleeps or breaking down and pulling out the heated blanket. After wearing the sleeves around for a few hours, my feet had shifted and shaped the fabric to fit to them, which gave me a good idea of where to stitch them up. Not very stylish, but pretty comfy. Since they’ll just be for wearing around the house and it doesn’t really matter what they look like, I decided to make the stitch on the outside. The seams of socks always bothered me when I was a kid, and I figured this would not be a small seam since the fabric is pretty thick, so putting it on the outside just made sense. I got started by pinning parallel to the seam, fitting the pins right next to my foot (and I managed not to poke myself with a single needle!). All pinned up, nice and snug. When I had pinned both sleeves to fit the appropriate foot, I took the sleeves off and pinned perpendicular to the seam line to prepare for stitching. All pinned up and nowhere to go. After both sides were ready, I moved to the sewing machine and started out with a basting stitch to hold the fabric together, then chopped the sleeve socks off of the remaining body of the sweater. I finished off each seam with an overcasting stitch, which I repeated two or three times on each sock to make sure the seam was nice and secure. Pipsqueek likes to help sometimes. The sides were a little uneven due to the way the fabric stretched out as I stitched, but they’ve proven to be pretty comfortable despite their odd shape and the strange placement of the seam. The length of the things is nice. They’re a little on the loose side (I used a ladies’ small sweater for this project), but they should tighten up a little bit each time they’re washed and dried – fortunately, this was a ‘machine wash, tumble dry low’ kind of sweater, so all three parts of this project will be easy to care for. This was another easy project – it took about 25 minutes to complete. And my cold little feet are thanking me! 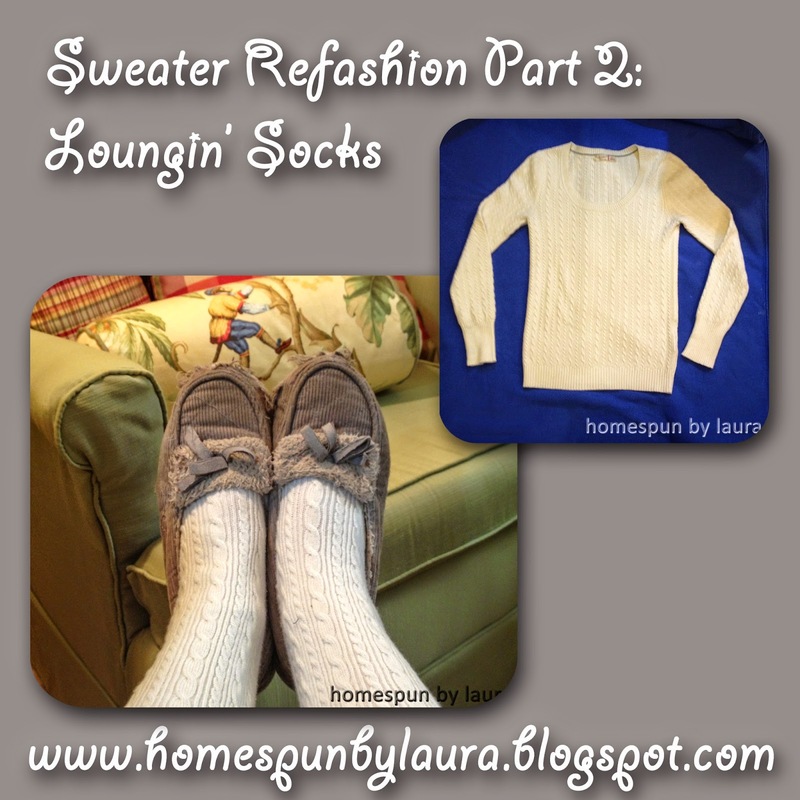 Next week, I’ll share the third and final part of this sweater refashion. Thanks for stopping by!